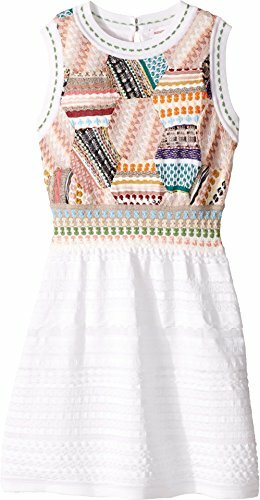 Show off your little one in this one-piece from Missoni Kids®. Scoop neckline. Sleeveless construction. Patched pattern at the bodice. Elastic waist with knitted skirt. Straight hemline. 100% rayon.Lining: 100% cotton. Professional dry clean only. Made in Italy. This item may ship with an attached security tag. Merchandise returned without the original security tag attached or a damaged tag may not qualify for a refund. Measurements: Length: 34 in Product measurements were taken using size 12-13 Big Kids. Please note that measurements may vary by size. Show off your little one in this one-piece from Missoni Kids®. Patched pattern at the bodice. Elastic waist with knitted skirt. Straight hemline. 100% rayon.Lining: 100% cotton. Professional dry clean only. Made in Italy. This item may ship with an attached security tag. Merchandise returned without the original security tag attached or a damaged tag may not qualify for a refund. Measurements: Length: 34 in Product measurements were taken using size 12-13 Big Kids. Please note that measurements may vary by size.